The American Staffordshire Terrier is a strong, smart and sadly, often misunderstood breed. Sometimes confused with their smaller cousins, the Staffordshire Bull Terrier, the Am Staff (as they are often called) is their own unique breed. Like many of their bully cousins, the American Staffordshire Terrier often has a tendency toward dry nose issues. 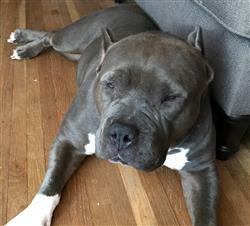 Your American Staffordshire Terrier may have a dry nose with some crustiness or the dryness may be a more extreme version pictured below, a condition called Nasal Hyperkeratosis. Nasal Hyperkeratosis is a condition of unknown origin which causes your dog's nose tissue to grow in crusty, scab-like layers. There is no cure, but regular usage of Nose Butter® will keep it under control, giving your AmStaff a healthy nose again. (More info on Nasal Hyperkeratosis HERE). The good news is no matter how dry your Am Staff's nose is Nose Butter is the answer. Your dog's ancestors were used to chase wild boar down and control bulls. Ok, let’s stop and think about that…they tracked, chased and cornered WILD BOARS. Have you ever seen wild boars on Discovery Channel? Those tusks, that ferocity, yikes! And subdue bulls…BULLS! Having a moist nose is what allows your dog to attract the smells that are floating by and process the info. This gives them the tools needed to guard and protect your family. If your dog can't get important scent info they may become anxious, less confident and edgy. Plus, you never know when a wild boar or bull will need to be captured and subdued. Nose Butter moisturizes your Am Staff’s dry nose, giving back their smell gathering mojo. This equals a happy, healthy, more confident American Staffordshire Terrier. Shop Our American Staffordshire Curated Collection for everything with American Staffordshire Terrier labels + recommended products. Fantastic product that works great! Libby’s nose is healing with the use of the nose butter! I can’t thank you enough! I am so glad I happened to find your product! Using lavender calming spray for dogs at shelter/rescue. Nose butter is nice. A little goes a long way. The nose butter works great for my dog, his nose gets dry sometimes and this help a lot. My dog knows what it means when I say he needs his Nose Butter, he doesn't necessarily enjoy it when I apply it, lol! This was a WONDERFUL find! I was desperate to avoid another expensive trip to the vet. This is my first Am Staff and as a nurse I was trying to 'doctor' it from home. I was on the internet researching all the possible things that could be happening to his nose, when I found Blissful Dog Nose Butter. I am so IMPRESSED. Not only is his nose better, but I will be ordering Paw Butter here soon. I have been sharing your info and my results with so many of my doggie parent friends. I am surprised how many people have never heard of it. It is a miracle cure for rough, sore and peeling doggie noses. Thanks! I was desperate to avoid another expensive trip to the vet. This is my first Am Staff and as a nurse I was trying to 'doctor' it from home. I was on the internet researching all the possible things that could be happening to his nose, when I found Blissful Nose Butter. I am so IMPRESSED. Not only is his nose better, but I will be ordering paw butter here soon. I have been sharing your info and my results with so many of my doggie parent friends. I am surprised how many people have never heard of it. It is a miracle cure for rough, sore and peeling doggie noses. Thanks!